Today in 1977, David Bowie released his second installment of the ‘Berlin Trilogy’ in the UK (the US release followed one week later). 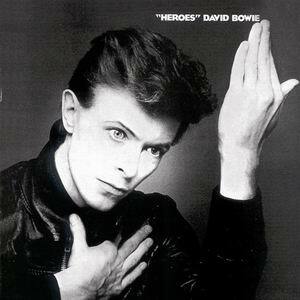 ‘Heroes’ picked up where ‘Low’ had left off and, once again with the help of Brian Eno, Bowie pushed things into a more raucous and positive direction. The album was recorded entirely in Berlin in a studio about 500 yards from the Berlin Wall. The title track, one of Bowie’s best known songs, was written about two young lovers who meet at the Wall. The producer, Tony Visconti, has said that during the recording of the album German Guards would watch the proceedings in the control room with powerful binoculars. Inside, Bowie was cementing his place as the pioneer of what-would-soon-become-known-as New Wave music, while paying tribute to his German influences Kraftwerk and Neu!. Both groups inspired several songs on the album. Upon it’s release, everyone hailed the album as a classic. Critics loved it. Fans adored it. Other musicians revered it. John Lennon was quoted as saying the album served as his inspiration during the recording of his last album ‘Double Fantasy’ in 1980. ‘Lodger’ would follow two years later and complete the ‘Berlin Trilogy’, but ‘Heroes’ was David Bowie’s last great record of the 1970s. The album ended a creative streak that saw Bowie continually mesmerize and baffle everybody with his originality and self-reinvention that was second to none. This entry was posted in For The Record. Bookmark the permalink.